The BBC is part of a "conspiracy" preventing the "radical changes" needed to UK democracy, the corporation's former director general has said. 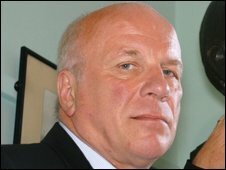 Greg Dyke told a Lib Dem conference meeting he wanted a commission to look into the "whole political system". But he said: "I fear it will never happen because I fear the political class will stop it." The BBC said its political coverage was taken extremely seriously and was highly regarded by the public. Mr Dyke said major changes he had wanted to make to the BBC's coverage of politics had been blocked. He told the Liberal Vision fringe meeting about the expenses scandal and how it had changed voters' attitudes: "The evidence that our democracy is failing is overwhelming and yet those with the biggest interest in sustaining the current system - the Westminster village, the media and particularly the political parties, including this one - are the groups most in denial about what is really happening to our democracy." Mr Dyke, who was forced to stand down as director general in 2004 after the Hutton report into the death of government scientist Dr David Kelly, said there had never been a greater separation between the "political class" and the public. "I tried and failed to get the problem properly discussed when I was at the BBC and I was stopped, interestingly, by a combination of the politicos on the board of governors, one of whom was married to the man who claimed for cleaning his moat, the cabinet interestingly - the Labour cabinet - who decided to have a meeting, only about what we were trying to discuss, and the political journalists at the BBC. He said the expenses scandal had been "British democracy's Berlin Wall moment" but he feared the opportunity to change the system was fading away. He called for an end to "pathetic jeering, shouting and childish behaviour" and the "pomp and ceremony" in Parliament. An independent commission should look at ideas such as moving the seat of democracy out of Westminster, a fully elected upper chamber with no whipping system, proportional representation, cutting the number of MPs by half, and reforming their pay and expenses, he added. "It's time to be radical. Our current model was designed for the 18th Century. It doesn't fit 21st Century Britain," he told the meeting. And he added: "We want more influence over our lives and we are not just prepared to hand it over to this strange bunch of people who stand for Parliament because they have been knocking on people's doors for 10 years." Speaking afterwards, he referred to an internal review of the BBC's political coverage carried out at the beginning of the decade, to which all political parties were asked to contribute. He said "there was a lot of pressure from the government of the day not to change anything", adding: "If you are in power what you want is you want to be covered and you don't want anybody else to be covered and they were scared that we were going to stop covering them." He denied the BBC had caved in to pressure from the government but added: "A lot of the governors were what I call semi-politicians and they liked the present system and.... maybe they were right - it's not the job of the BBC to change the political system and to start questioning the political system. "I happen to not agree with that but, you know, we didn't get anywhere." Asked what specific changes he would like to see in the BBC's coverage, he said: "Most of the politicians didn't want a different way of covering politics. "They wanted their mugs on the telly basically and we might have moved away from that." He denied his comments were meant as a criticism of BBC journalists in particular, but added: "In the end political journalists live in the same narrow world as politicians do and they don't see a need to change because they think it's the world. They just don't understand that out there it's very different." In a statement, the BBC said Mr Dyke was "entitled to his views". It added: "Our news is highly regarded by the public. Anyone looking at the depth and range of our political coverage will know how seriously we take the reporting of politics and political institutions."